In an effort to clean up my draft posts, the next series of recipes I will be posting are recipes that I have made, took pictures of and then for whatever reason, placed in my draft file and simply forgot about. Until now that is. 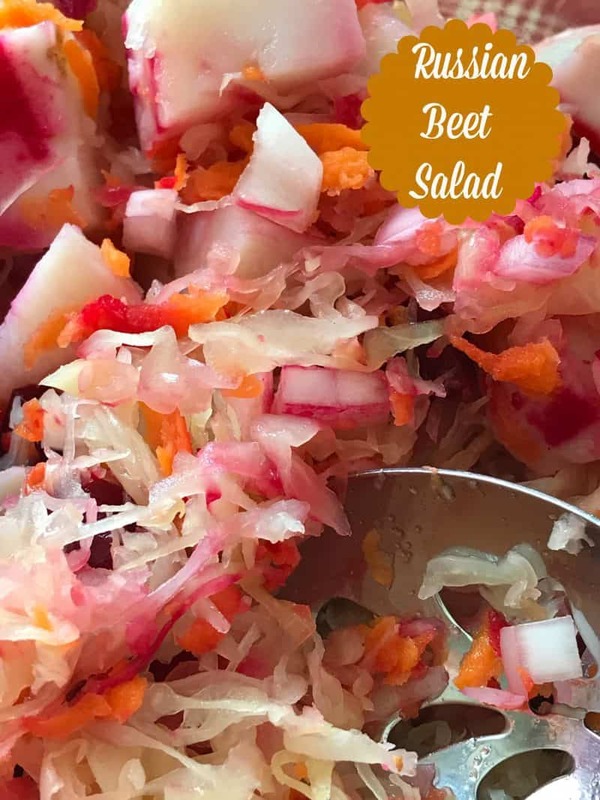 Many of the recipes were made over the winter months but this particular recipe for Russian Beet Salad was made last fall. I decided to start with this recipe because it has been in draft form the longest. This recipe comes to you via Olga’s Flavor Factory A fantastic food blog with delicious recipes and kitchen tips. Olga’s online kitchen is packed full of step by step recipes and kitchen tips to make homemade cooking easier, practical and of course, more flavorful. Many of Olga’s recipes are Russian. If you’re like me and like to try recipes from around the world, Olga’s is the place to look for Russian recipes. Summer was winding down and I was looking for a recipe that I could serve with the grilled chicken legs we were going to have for dinner. I didn’t want to have to run to the store to pick up ingredients so that meant I had to find a recipe that had ingredients I already had on hand. 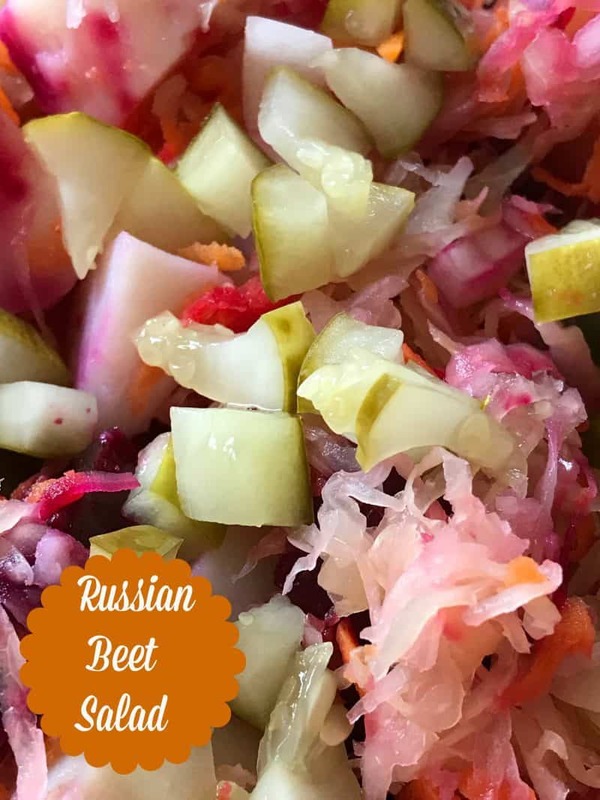 When I came across this recipe for Russian Beet Salad, I knew I hit the jack-pot, I had every single ingredient it called for, even the sunflower oil. So Russian Beet Salad it was going to be. By the end of summer we are pretty much potato salad, macaroni salad, fruit salad out. Meaning, we’ve eaten about as many mayo based salads as we possibly can eat…this salad was going to be different and different it is. We have never eaten a salad with an ingredient list like this one. 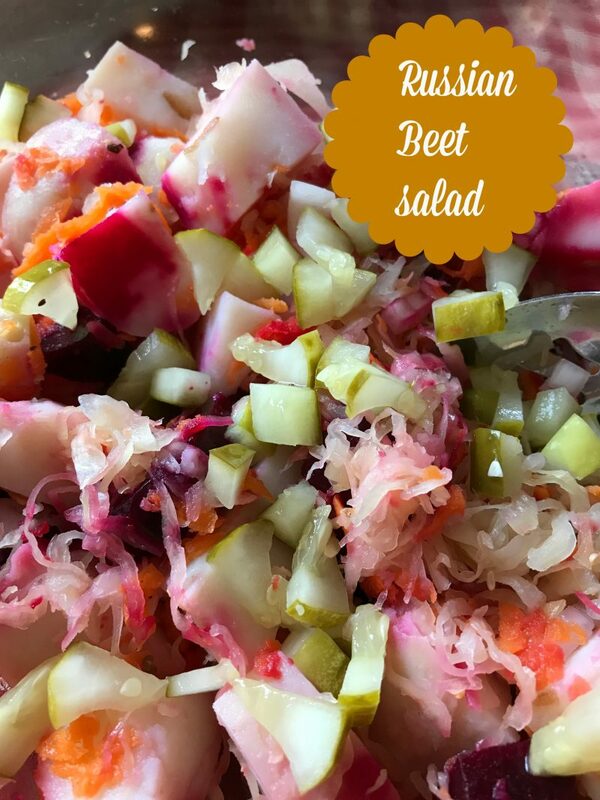 Beets, potatoes, carrots, pickles, onion and sauerkraut..tossed with oil and vinegar. According to Olga from Olga’s Flavor Factory, you know your Russian if you recognize this salad. This vibrant red salad or side is served at holidays, special occasions and parties. Even though it’s called “Vinegret” in Russian, and does sound like vinaigrette, it’s an actual salad, not a dressing. 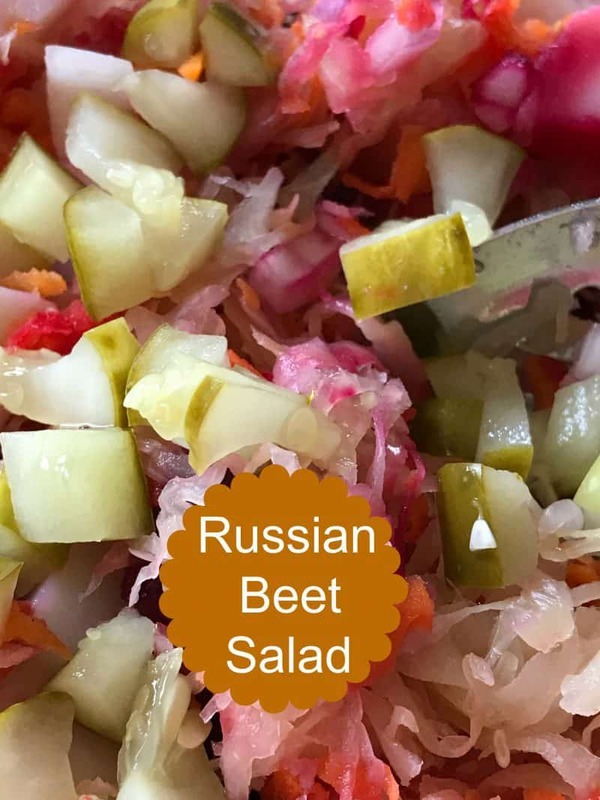 This salad is made with ingredients that are readily available in Russia during the most popular holidays; Christmas, New Year’s and Easter. This salad is about as different as can be but even though it sounds unusual, I can assure you, it’s delicious. It makes a great side for any occasion. Cook beets in boiling water or roast the beets until tender. In another saucepan, place the potatoes and carrots. Cover the vegetables with cold water. Cover the pan, bring the water to a boil, reduce the heat to a simmer and cook just until the carrots and potatoes are both cooked through and you are able to pierce them all the way through with a paring knife.You want to make sure that they are cooked through all the way, but not too much. You don’t want them to turn to mush when later mixed with the rest of the ingredients in the salad. Cool the beets, carrots, and potatoes until cool enough to handle. Chop the beets, carrots and potatoes finely, roughly about the same size dice. Chop the pickles to roughly the same size of the beets, potatoes and carrots. Finely mince the shallot or red onion. Mix all the ingredients, including the sauerkraut, and pickles in a large bowl. Season with salt and pepper. Pour in the oil and vinegar. Mix to combine. Store in the refrigerator. This salad can be be made up to 3 days in advance. You can also add fresh herbs right before serving such as dill, parsley or green onions.